Welcome to Our 3-Year-Old Room! Wow! Where did the time go? There are only four more weeks left to our school year. What fun we’ve had watching our three year olds become more independent, grow, and mature over the last eight months. They’ve had many new experiences, making new friends, learning class routines, sharing, taking turns, following directions, walking in a line, using inside voices and walking feet, talking in a group situation, and helping to clean up their toys. Each day, during our Moring Meeting, the children wait patiently for their turn to be the leader of the day, help with the calendar, or to be the weather forecaster. Our children are enthusiastic, energetic, and bright boys and girls who love to be challenged. Whether it’s guessing what’s in the Mystery Box after clues are given, playing games, or solving puzzles, they keep us on our toes. They are all very observant and curious learners who notice any changes in our room, like when our new windows were installed or when someone is missing from our class. April has been a very special and exciting time in our classroom. We’re learning about the Life Cycle of a Chick, hands-on! On April 14th, each child carefully placed a brown fertilized egg into our incubator. 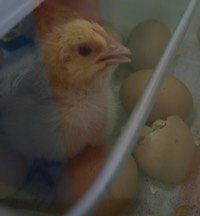 We talked about the importance of maintaining the appropriate temperature and humidity in the incubator, since we do not have a mother hen in class to do that very important job. Every day, we count down the number of days left until the chicks will begin to pip their way out of their shells. It’s amazing that this miracle only takes 21 days! We are anxiously awaiting their arrival around May 4th. After they hatch, we’ll keep them in a brooder in our class until they’re ready to be sent to the farm, which will be approximately two weeks after they hatch. We’ll keep you posted!